↑ DiMassa, Cara Mia. 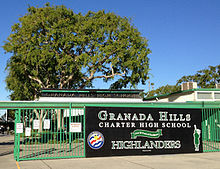 "Granada Hills Gets Charter OK." Los Angeles Times. 14 de mayo de 2003. Consultado el 8 de enero de 2016. ↑ «Why hedge funds love charter schools». Washington Post (en inglés). Consultado el 2019-04-18. ↑ «Charter Law Database | National Alliance for Public Charter Schools». www.publiccharters.org (en inglés). Consultado el 2019-04-18. ↑ Brown, Emma (4 February 2015). "Are charter schools public or private?". Washington Post. Retrieved 21 February 2018. ↑ Carnoy, Martin (1998-08-01). «National Voucher Plans in Chile and Sweden: Did Privatization Reforms Make for Better Education?». Comparative Education Review 42 (3): 309-337. ISSN 0010-4086. doi:10.1086/447510. Consultado el 2019-04-18. ↑ «Chile's School Voucher System: Enabling Choice or Perpetuating Social Inequality?». New America (en inglés). Consultado el 2019-04-18. ↑ «Pinochet’s Policies Still Rankle in Chile | Inter Press Service». www.ipsnews.net. Consultado el 2019-04-18. ↑ «Colombian Educational Systems». www.bgcenter.com. Consultado el 2019-04-18. ↑ www.justlanded.com https://www.justlanded.com/english/Colombia/Colombia-Guide/Education/Private-education-in-Colombia |url= sin título (ayuda). Consultado el 2019-04-18.